What Is Nationalism? Both Brexit and Trump represent a turn toward nationalism. In recent essays and in my forthcoming book The Virtue of Nationalism, I revisit the Anglo-American origins of the belief in the freedom of nations, and argue that a world of independent nations is still the best form of political order for mankind. What Is Conservatism? With British and American conservatism in disarray, I have been writing on the foundations of Anglo-American conservative political thought. Anglo-American conservatism is an irreducibly nationalist political tradition, but it is also inseparable from religion and the Bible, limited government, and an historical empiricism (or “common sense”) that makes it skeptical of claims to universal reason. For an introduction, read my essay “What Is Conservatism?” together with the historian Ofir Haivry. The Bible and Political Life. Many would be happy if we could remove the Bible from modern political life. But we can’t. The modern state is born out of Protestant political theories strongly shaped by the Hebrew Bible (“Old Testament”). I’m interested in making this clear–and in getting a clear view of what is happening to us as the Bible is removed from the public life of nations. Other background you may want to know is this: As an undergraduate at Princeton in 1984, I founded the campus conservative journal, which I named The Princeton Tory. Later, in the early 1990s, I worked as an aide to Israel’s opposition leader Benjamin Netanyahu, accompanying him to the Madrid peace talks and assisting in the publication of two of his books. Beginning in 1994, I was head of the Shalem Center, for many years consdered Israel’s leading conservative think-tank. 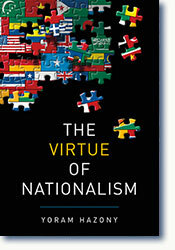 The Virtue of Nationalism (New York: Basic Books, 2018). “Conservative Democracy,” First Things (January 2019), pp. 19-26. Why Does Facebook Think I’m ‘Political’? The Nationalist Spirit of 2016: A Conservative Spring?